A6 postcard available for sale now, See order form. My friend Judith is a fresh seafood producer on the west coast of Scotland. 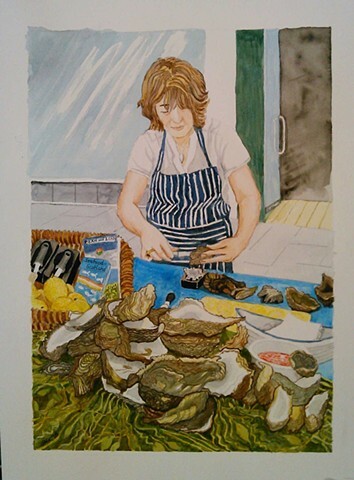 Judith comes to Perth Farmers' market on a monthly basis and sells oysters and mussels to an eager public. I have finally 'got around' to doing a painting for her and her business as I thought Judith made an excellent subject for a study.